Every time you make or receive a phone call on your iPhone - your iPhone records the source and length of the call. These logs also include any Face Time calls made with your iPhone, iPad or iPod Touch. Your call log history displayed on your device is limited to the last 100 most recent calls. If you wish to keep a record of calls made and received on your iPhone, for your reference or perhaps for a legal reason, TouchCopy can help you with this. 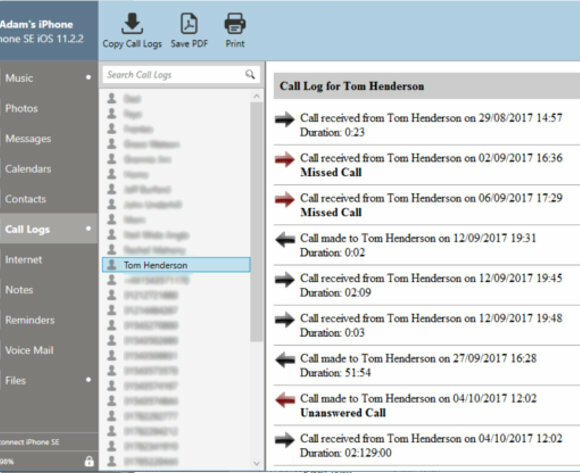 Using TouchCopy, you can browse your iPhone Call Logs and, for safe keeping, save them to your PC or Mac as HTML documents for viewing in your Web Browser. Simply download and install TouchCopy on your PC or Mac and run the free demo version of the software. 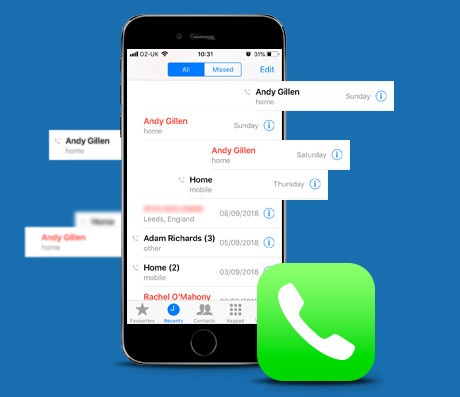 You can view all your iPhone call logs by clicking on the "Call logs" button in TouchCopy. Backing up your all iPhone call logs is as simple as clicking on the "Copy" button within TouchCopy, which saves all your call history as a HTML file. Please visit the TouchCopy user guide for more information on how to export iPhone call history to your computer. TouchCopy free demo download works with all models of iPod, iPhone and iPad and is available for both Mac and PC.